The Sheriff’s Office is responsible for all waters within the County (1153 Lakes and Ponds, 30 Rivers and Creeks,) totaling 23 square miles of open waterways. 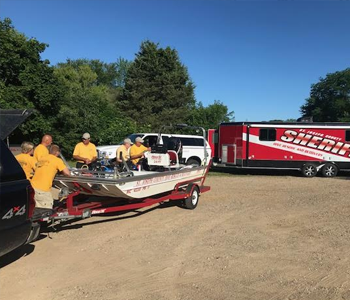 The dive team performs search and rescue operations, evidence collection, as well as conducts public education on water safety. The Dive and Rescue Division has a twenty-five person roster made up of divers, boat operators, and ground support. The Team has a K-9 Cadaver dog with specialized training for open water recoveries. The dive team has specialized training for their members on a monthly basis.